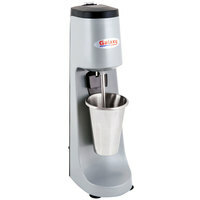 Craft delicious malts and milkshakes with the Galaxy SDM400 single spindle 2 speed drink mixer! This drink mixer features a 2 speed ball bearing motor for outstanding performance and long-lasting durability. The suction cup feet underneath the heavy, durable base reliably hold this mixer in place during use. For added convenience, this machine comes with a stainless steel malt cup so you can begin making milkshakes right away. The cup quickly and easily attaches to a hinge that initiates the spindle for easy mixing. As an added safety feature, the mixer motor will not engage without the malt cup in place. This little drink mixer is great. It doesn't work super fast, but if you have a small coffee shop with only 5-10 shakes a day, it's perfect. If you're an ice cream shop, go with something a little more powerful. This product works great for my business. Can actually handle large orders andnisnnot very noisy. Great add for my business. Im glad to have found it. Working great for me so far!! Very easy to use and user-friendly. You can leave the cup sit on the mixer while you are doing other things which is nice. We've only had compliments on our milkshakes! Just what we needed. Strong little blinder. Hoping to buy two more soon. Would recommend to anyone. Would be perfect for the house as well! Easy to use and easy to clean. Good for us, as we're not super busy making milkshakes. A busy place would need something more substantial, but it is perfect for what we need. It is Very good Mixer it works great. It has different speed is for all kind of milkshakes, I absolutely recommend it is really good. WORKS AMAZINGLY!! This drink mixer is easy to use and easy to clean too. There was no need to set up anything. Just out of the box and use! Makes really good milkshake in seconds! We love our milkshake mixer!! It’s one of our favorite things to use during the summer. We get to experiment with different flavors and it makes the best shakes! This is great! I love milkshakes. This is the best and quickest way to get those milkshakes you always love. It is a sure way to get that restaurant quality milkshake you get from your favorite shop you go to. Works Great! It can’t handle super thick mixes, but for a basic milkshake it works perfect! Two setting for speed. Easy to clean. Suction cup bottom. The machine works much better with soft serve ice cream than it does with scoopable. It takes some getting used to, but works well after some practice. Terrible!!! Not powerful enough to blend anything no matter how much milk you add. Doesn’t go deep in the cup enough to mix the bottom of the cup. I bought 2 machines and they are the waste of money. This is a great mixer for the price, it works very well on our small shop. I love that it is compact and doesn't take up much room. It is a little noisy from time to time, and requires a little extra effort to get ingredients completely mixed together. Your ice cream cannot be completely frozen, the blade has a hard time mixing if it is too hard. Great Galaxy 2 speed drink mixer. We use it to make milk shakes in the diner. It does the job and is very well crafted. Great for a small business, very easy to use and clean. We make about 10 milkshakes per day and so far it been working great. Used this for a couple of weeks now, so far, so good. Definitely not top tier but for the price it powers through hard ice cream and even comes with extra mixer blades. For us it works better to manually turn it on and then move the cup freely. Works great! Make sure you use enough milk and it works perfectly. Super easy to set up and turns on fast. Make sure your cup is hitting the activator switch or it doesn't turn on for safety reasons. Made several milkshakes the first day perfectly, way better than a blender. We use this drink mixer to make smoothies but mostly for ice cream milkshakes and it does a great job. The only down side is that the rod does not get all the way to the bottom. This mixer is a great value. The size is compact and can fit almost anywhere. We use it with hand-dipped ice cream and it mixes the shakes up perfectly! No complaints about this product from me! Very Solid machine! The suction cups are strong enough to keep the mixer upright during traveling with our concession trailer, and boy do we sometimes hit some rough roads. The mixer mixes malts and milkshakes perfectly! Also comes with spare parts for the mixing part. Very happy we bought this machine, it's going to make us a lot of money! Great drink mixer and easy to use. We use it at our restaurant to max ice cream milkshakes. Excellent price and definitely serves the purpose as we grow. We bought this mixer for a small cafe that we have. Read some of the other reviews and was a little skeptical but for the price I thought it might be a nice addition. It is an AWESOME machine! We made our investment back the first weekend. We had no problems getting the mix to blend through the machine and it even comes with an extra set of blades. Well worth the price. This is amazing! Great starter milkshake maker. Easy to clean and mixes shakes very quickly. Would definitely recommend for someone as a first time shake maker. Would buy again! I loveeeee this machine. I was able to add milkshakes to my menu as well as service customers fast. Would buy it again without hesitating. DON'T BUY THIS PRODUCT AT ALL, THIS DRINK MIXER DOEN'T MAKE SHAKES WITH ICE CREAM. THE MOTOR DOESN'T HAVE ENOUGH POWER FOR NOTHING BUT EGGS. Thank you for reviewing this, Carlos. We are sorry this drink mixer has not met your standards. A Customer Solutions Representative will remain in contact with you on this issue. GREAT PRODUCT! Everything you need to start making your Shakes or "Blizzards". Very well built and sturdy. Easy to keep clean and doesn't take up a lot of room. Thank you for your review! We are sorry you are not happy with this drink mixer. In order to help this drink mixer work to its full potential, we recommend adding more milk to your milkshake mixture and moving the cup around the spindle to begin incorporating the liquid. Not adding enough liquid to the hard ice cream can cause improper mixing or even eventual motor failure. This mixer is great! Not only does it do a great job on Milkshakes, But it makes the best omelets ever. Just whip 3 eggs and you have the fluffiest omelet in town. Buy a couple mixing cups to go with it. I just LOVE the fact that the cup comes with this model. A lot of other places that sell other models want you to buy the cup SEPARATELY. But not out friends as webstaurant. They give us what we immediately need! LOVE this product. It is very affordable and easy to use. I love the simplicity and the overall value. Two thumbs up, great deal to save the least! If you're looking to add to your drink mixing arsenal, look no farther. This single 2 speed mixer is great for adding an extra mixer to a station or to bring it on the go in a food truck or cart where space is limited!! Mixes the perfect milkshake quickly. So glad I went with this rather than the cheaper one I was considering. Great that no assembly is required & the suction cup bottom is a +. This mixer does come with a cup. I didn't see that and purchased an extra one but I am sure I will use it.